No single family perfectly captures the diversity of a country of more than a billion people, so when TIME set out to tell the story of India's first 60 years through the experiences of three generations, we had to make choices. Should we pick a rural clan, because India's masses live in villages, or city folk, because change is coming faster to urban India? What about a family living in one of the high-tech southern hubs of Bangalore or Chennai, or one from the teeming, poorer northern cities? In the end we settled on the Malhotras, a middle-class clan in New Delhi, because their experiences echo modern India's three ages: the joy and pain of independence; the era of stifling socialism; and the current burst of growth and optimism. The family history that follows tells how far India has come  and how far its people still wish to go. In the months leading up to India's independence in August 1947, millions of people in villages and cities around the land prepared to mark the event with ceremonies and fireworks, speeches and parties. For those living along the religious fault lines that dissected the north of the country, though, the mood was more fearful than celebratory. Would the departing British colonial rulers partition the country  split it into separate Hindu and Muslim nations  before they handed over power? And if they did, where exactly would the new frontiers lie? In Lyallpur, the third largest city in the predominantly Muslim northwest, 21-year-old teacher Santosh Malhotra, a Hindu, was debating whether to move east to avoid getting stuck on the wrong side of a new border. Religious tensions were rising, stoked by historical grievances, demagogic politicians and a sense of chaotic urgency as the day of independence drew closer. Santosh's father, the son of a successful Punjabi trading family, was away at his job in the army. Her mother and her younger siblings had already left to stay with an uncle in New Delhi. With her in Lyallpur were her husband Devraj, a clerk at a cotton mill, and her charismatic older brother Ram Swarup, who said he would ride his beloved horse across the new border if things got too hot. "The situation was not clear for a long time," Santosh remembers now of that period. "We weren't sure what the future held." One afternoon, about two months before independence, word came to Santosh that her brother was dead. To this day, the family believes Ram Swarup died after drinking milk poisoned by a Muslim extremist intent on driving out the Hindu community. "A Muslim bribed the Hindu shop owner to poison him," says Santosh. "It broke my heart." The following days were a blur: Santosh's father rushing home from his army job, her mother and uncle returning from New Delhi, her brother's funeral  and growing unrest in the streets after the British confirmed that Lyallpur would be part of the new nation of Pakistan. "We used to discuss freedom from the Britishers," she says. "But we were, to be honest, happy with the existing situation. Freedom, yes, but the changes upturned our lives." 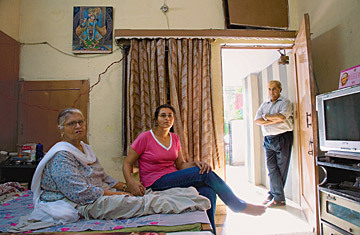 Santosh's family, while not wealthy, had much to lose. Now 82, Santosh remembers growing up in Lyallpur with affection. "It was a very comfortable childhood," she says, sitting on her bed in New Delhi, a fan slicing slowly through the thick summer air. "We played outside in the streets with no worries." Her father's family traded foodstuffs  wheat, lentils, sugar  and owned property in one of the city's Hindu neighborhoods. Soon after Santosh was born, her father, who had joined a local bank as a clerk, was promoted. "He used to say that I had brought him good luck," says the old woman, the second of her parents' six children. Santosh lives now with her son, daughter-in-law and granddaughters in a middle-class neighborhood called Vivekanand Puri. Her bedroom is painted fawn and has a bed, a bedside table and a television on a small wooden stand. She struggles with arthritis and in the past few months has begun spending most of her days in bed watching TV, talking to family members or sleeping. Her long hair is pulled back tightly off her face. Her earlobes hang heavy with gold earrings. She tires easily but when she speaks about the past her eyes light up. Most girls in her extended family left school by age 10, but Santosh studied until she was 13. "My mother was educated and she wanted education for me and my sisters," she says. Later Santosh began teaching in a tiny private preschool a few blocks away. When she was 19, a local pandit, or educated man, offered to tutor her so that she could work in a government school. "Teaching was one of the few jobs women could do," she says. "Yes, I liked it but it wasn't a choice. Today's women are more active and it's good they have that choice." Santosh's family arranged her marriage, to a young man named Devraj. Through the heavy veil that covered her face at the wedding, Santosh couldn't make out her new husband's features and didn't lay eyes on him until they arrived at his house the following day. "He was a good man," she says of Devraj, who died in late 2002 and whose photo hangs above her bed. "I was lucky." Leaving was incredibly dangerous. There were four army trucks and one car in all, into which some 500 people were crammed like entombed warriors, upright and shoulder to shoulder, Santosh's mother perched on a box that contained her only remaining possessions  a sari, a suit, some jewelry and a photo of her dead son. "It was raining, children were thirsty," remembers Santosh. "I was worried about my husband." Just before they reached Lahore, one of the trucks broke down and the convoy stopped for about an hour while it was repaired. There was a steady stream of buses and trucks headed for the border and trucks coming the other way, too, carrying Muslim refugees from India. Rioters were attacking some of the vehicles headed out of Pakistan. At one point, Santosh says, she saw a truckload of bodies. "Everyone was praying to the gods that we would reach India safely," she says. Finally, the convoy reached Amritsar, just across the new border. Over the coming weeks between 800,000 and 2 million people died in the sectarian fighting. Up to 14 million people crossed the world's newest frontier, an incredible exchange of humanity and one of the largest mass migrations in history. Santosh and her family ultimately reached New Delhi, where they lived in tents for 18 months until the ruling Indian National Congress gave them (and thousands of others) land as compensation for their forced migration. Jetendar Malhotra, Santosh and Devraj's chubby-faced third child, was born in 1953. By then Santosh had started teaching again. "I had to earn because everything we had was left in Pakistan," she says. Her husband got a job with a government cotton mill. "I don't have ill feeling about that time," she says. "I was angry but when you see so many people in the same position with the same problems, you know it's not just happening to you. It was not a personal suffering."